I have walked by Wu Liang Ye many a time, usually on my way to Hing Won, and often wondered about it. 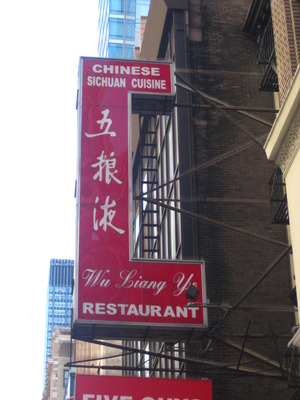 This chilly Monday, I was headed into the city to have lunch with TT when he realized that it wouldn’t be a good idea because it’s busy season for him… so Beer Boor asked if I wanted to have a bite over at Wu Liang Ye. I agreed. Unsurprisingly, though he’d been there countless times and I’d never been, Beer Boor allowed me to dictate the entire order. 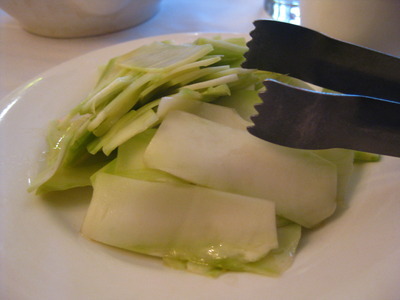 I decided to order all over the map, but no one stopped me… the first up, Sichuan pickles. I’d been hoping for the cucumbers, but these thin squares arrived. I thought they were thinly shaved broccoli stems, but Beer Boor disagreed because there was no broccoli flavor. My blank stare and “Um, they taste pickled, duh” were met and I dropped the topic. Whatever – these became key in putting the fire out in my mouth later. … but tasting oh-so-fine! A good kick if you drowned the dumpling in the oil, which Beer Boor proceeded to do while I lightly tapped excess oil off mine and enjoyed the kick I could handle. Next was an order of dan dan noodles, springy white noodles served with chopped chili and minced pork, a bit of Chinese broccoli, and a lot of chili oil. After carefully mixing it all up together, this is what it looked like (also after both of us had taken some). 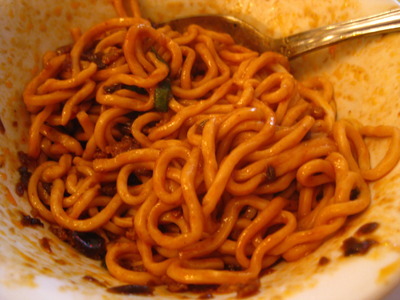 Each strand coated in the fiery chili oil, the noodles themselves springy, bouncy, and the scattered bits throughout adding the occasional punctuation of texture. YUM. I inhaled most of this (with permission). 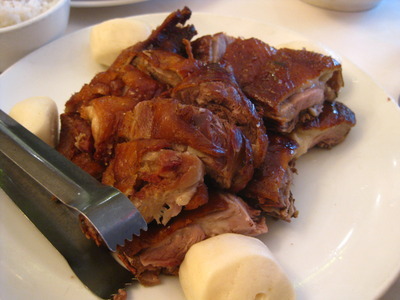 A half order of a tea smoked duck – meaty bits mixed in with bits with bits with lots of bone. Unfortunately I seemed to luck into all of the bone pieces while Beer Boor merrily chomped away on the boneless pieces. Boo. The flavor was excellent otherwise, with lots of fat running down my chin as I struggled to bite the meat cleanly off the bone. The last dish I chose was the double cooked fresh bacon (aka pork belly), a very popular dish at Sichuan restaurants. 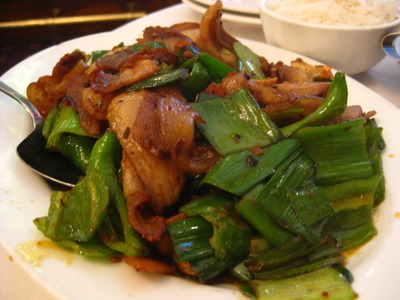 Green peppers and lots of leeks were included in the dish – very well cooked green parts of the leek – and pieces of sliced pork belly coated in chili oil. Surprisingly, this dish wasn’t very spicy at all, and I ate a decent amount of it happily before relinquishing to that stuffed feeling in my belly. Burp. Yvo says: Some seriously good food here, I will definitely be back to try more. It is a sit down restaurant, so build that into your cost expectations, and it’s not bad… if you don’t over order like some people (ahem)… I would definitely go back to order just the dan dan noodles for lunch! So good! So springy and spicy delicious! Not sure how that block got two really good, fairly authentic Chinese restaurants in all of Midtown, but… whatever, not going to look a gift horse in the mouth! Sorry for blowing the plans that day, seems like you got by just fine. 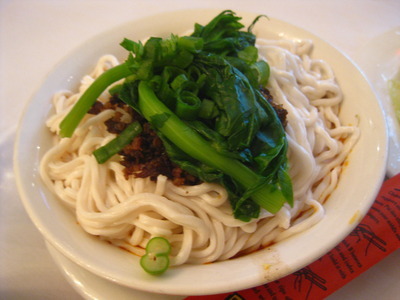 We should check out 39th Street for Szechuan Gourmet and Lan Sheng. This is one block from my office! I can’t wait to eat there–bring on the chili oil!!! This sounds excellent and I will certainly check it out for lunch if I ever have the misfortune of being stuck in Midtown for work. Stuck in Midtown for work: bad. Stuck in Midtown for lunch: surprisingly all right. I do love this place, and now I have more dishes to repeat on a future visit, as Yvo chose nothing (save dumplings) that I’ve ordered previously. Also, don’t be deterred by the double-spicy icon: the double-cooken bacon was surprisingly tame. Did the pork belly have the double pepper icon? I thought it only had one. I can’t remember the last time I had Szechuan food. Bad food blogger? I must be a bad Asian too. I don’t even recall eating dan dan noodles. If I did, way way too long ago. HAHA. 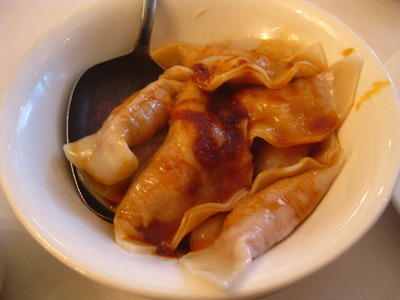 Mmm dumplings in CHILI OIL!! I go often, and regardless of what else we order, I always get the Spicy Prawns and Asparagus, and the Chicken and Capsicum. My favorite chinese joint in the city.